Get ready for the NZ Chocolate Awards! After judging more than 120 New Zealand made chocolate bars, bonbons and truffles last year, the NZ Chocolate Awards is back for 2018, bigger and better than ever. The NZ Chocolate Awards 2018 will be judged on Wednesday 12 September at Auckland’s Fresh Factory, with the results to be announced during NZ Chocolate Week, on the eve of the NZ Chocolate and Coffee Show. The Chocolate & Coffee Show will be held in Auckland again at The Cloud on Saturday 6 and Sunday 7 October. 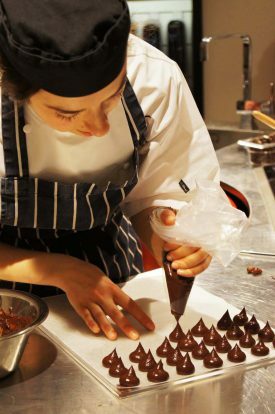 As well as aligning the announcement of NZ’s finest chocolate makers with NZ Chocolate Week, the organisers have appointed Elle Crocker (aka Elle Coco) as head judge. Elle will be supported by an independent judging panel of food experts. This year the only chocolatiers in the judging panel will be those without products in the competition. Elle Crocker, Head Judge of the NZ Chocolate Awards 2018. Organisers of the NZ Chocolate Awards, Intermedia NZ and Marvellous Marketing, welcomed Elle to the team saying she would add a new level of experience to the judging, which would in turn help the country’s burgeoning chocolate industry. With Elle’s guidance the categories for 2018 have been refined. One chocolate product will be named Supreme Champion from the Best in Class winners across categories, which are: bean-to-bar chocolate bars; flavoured bars; filled chocolates including ganache and bonbons; bark, brittle, dipped fruit and nuts; best NZ made product using chocolate; drinking chocolate; best children’s chocolate; and best packaging. Judging samples must arrive in Auckland between Monday 3 September and Tuesday 11 September. Judging will take place on Wednesday 12 September at Fresh Factory, Auckland. Results will be sent to entrants via email on Monday 17 September with Gold, Silver and Bronze medal winners made public on Tuesday 18 September. Best in Class winners, including the Supreme Champion will be announced on Friday 5 October 2018.